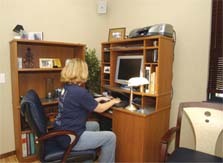 A 2002 Crowder College team member worked on the computer in her team's home business office space. Because many American homes now have offices, the Home Business Contest had the 2002 Solar Decathletes demonstrate that a solar-powered house could provide adequate energy to operate home office equipment. Crowder College won the Home Business Contest with a perfect score of 100 points. The judges said in the Crowder home, they appreciated the variety of available audiovisual equipment that could accommodate a number of home and office activities. The team nicely organized the layout of the combined living and office space to maximize its efficiency. You can learn more about Crowder College's home and team.